San Manuel Casino changed its name and logo from its former San Manuel Indian Bingo and Casino in 2017 after closing down its bingo hall. 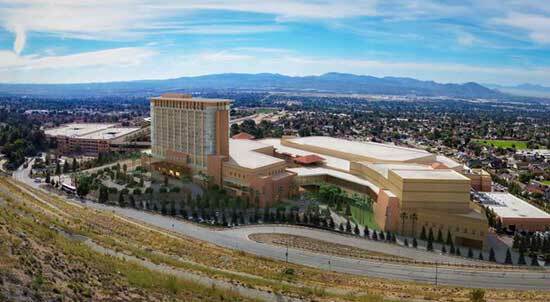 San Manuel Casino announced plans in Nov 2017 to add an onsite hotel and new amenities a spa, 6-story parking structure and new entertainment venue. Construction began in July 2018 with an estimated completion of years. The hotel's opening date has not been announced but is expected to be in 2020. Updates will be posted here. A 5,000 square foot Asian gaming area with 60 slot machines, Pai Gow, baccarat and blackjack. Bar Bar Bar, the landmark bar in the center of the casino's ground floor, with seating for 70 guests, 20 tabletop video poker terminals and 3 blackjack tables. San Manuel permanently shut down its long-running bingo hall. 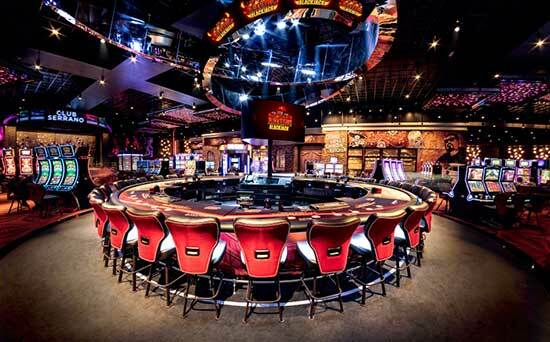 High Limit Room - Open 24/7, 5,000 square feet, 68 slots and 8 table games. Lotus 8 Palace (Asian Gaming Room) - Open 24/7, 60 slot machines, Pai Gow, baccarat and blackjack. Rock & Brews Restaurant - Must be 21. Open 8am-3am. Casual. Street Tacos - Located 2nd floor. Open 11am-11pm. Till 3am Fri-Sat. The Pines Modern Steakhouse- An upscale steakhouse open for dinner Wed-Sun, 5-10pm. Tutu's Food Court - First floor, open 24 hours, 140 seats, must be 21 years of age or older to enter. Finish Line Bar - Open 24 Hours. Second Floor. Bar Bar Bar - Open 24 Hours. Center ground floor. Round-up Bar - Open 24 Hours. Second Floor. San Manuel is building a 500-room hotel that will open in 2020. The hotel is part of a major property expansion that includes a 4,000-seat entertainment venue and a 2,200-car parking structure. A $550 million expansion project is underway at the San Manuel Casino. Most of those changes are taking place inside the gaming venue. A giant table for blackjack was just added. On August 10, 2018 the new Blazing 7's Blackjack arena opened. It is located in the venue's Rockin' Casino section. Currently there are over 100 game tables at the casino. However the giant blackjack table gives the guests something different from other casinos in the area. The section where previously the promotion area was is where the new arena is located. It can be found between Rock & Brews and George Lopez's Chingon Kitchen. The table is actually six tables that have been attached together forming a giant circle. This allows for six different games can be operated at one time. 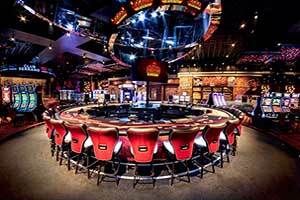 There are six table game dealers and seats for up to 36 players. The table is open everyday from noon to 2 a.m. The new arena allows for more seating options for guests and for larger groups of friends to play together. The seating is similar to what would be found at a bar. Guests sit next to each other making the experience for them more of a social one. The area has proven to be very popular with guests. The evening time is when it has been the busiest. It has been regularly full from 6 p.m. to 2 a.m. daily. Games that guests can play are traditional blackjack or in a progressive wager. Players bet a $5 side bet where they may win the progressive jackpot. Only players in the arena can participate in this game. The casino is owned by the San Manuel Band of Mission Indians and is located about an hour away from Los Angeles. The hotel will offer modern luxury for guests. 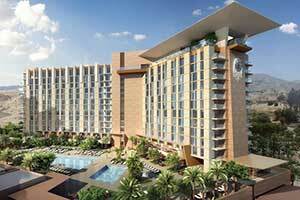 Amenities that will be offered will mark the hotel as a destination in the area. In San Bernardino County, the San Manuel Band of Mission Indians is one of the top ten employers for the area. Currently there are over 4,900 people employed by the tribe. Over $1 billion is earned yearly in economic growth to the area from the tribe or businesses that support the casino operations. The San Manuel Indian Reservation is located near Highland in California. The tribe is federally recognized. Currently there are over 4,800 slots in operation at the casino. Table games include poker and blackjack. There is also an area for high limit gaming. An announcement was made that a new expansion project will be developed near the casino owned by the San Manuel Band of Mission Indians. The project includes a parking structure with 2,200 spaces for vehicles, a hotel with 500 guest rooms, and an entertainment venue with 4,000 seats. The project is in the design phase. An estimate of cost has not been released. Early 2018 is when the construction is scheduled to start. The project should be completed in 2 years. 1,400 construction jobs will be created. An additional 1,200 jobs will be created when the new areas open. There will be between 15 and 17 floors for the new hotel. There will be space for gaming, dining, shopping, pool, and spa. The name of the hotel has not been released. Residents of the cou8nty will be able to review the plans for 30 days to make comments on noise, traffic, and aesthetics. After that time the Tribal Environment Impact Report will be drafted. For 45 days the public will be allowed to comment on the draft. After that time the report will be submitted to the state. Plans have been announced for a new expansion at San Manuel Casino. The project will expand the casino floor. The new floor will allow for an additional 500 slot machines. In total the casino will operate 4,700 machines. This will make the San Manuel Casino the largest slot machine operator on the west coast. The San Manuel Band of Mission Indians believe this project is a way to remain committed to providing their guests with a great gaming experience. The project will also add more jobs and help with their partnerships with other businesses. SAN BERNARDINO - The San Manuel Indian Bingo and Casino is turning to 3D slot machines to attract customers. They believe some players are tired of simply hearing bells go off and are ready for the next step in slot machine entertainment. So San Manuel is bringing in some new slot machines manufactured by Reel Depth. These are much different from ordinary slot machines by featuring a multi-layered display to create 3D looking animations. Players will not have to wear 3D glasses. Games that will be available soon are Double Diamond, Sizzling 7's, Slingo Jackpot, Triple Stars, and Red White & Blue. Others will follow soon. All will come in 3, 4, or 5 reel varieties. SAN BERNARDINO - The San Manuel Indian Bingo and Casino in Highland has opened its new Pines restaurant and nightclub on the second floor. Dinner is served Wednesday through Sunday from 5pm to 10pm and closed the other days for private events. The menu is California Eclectic offering seafood, steaks, and decadent desserts. Entr�es average $30 and appetizers range from $10 to $16 each. The restaurant can seat up to 150 diners and the lounge can host up to 350 people. The dancing hours are Thursday to Saturday 10pm-3pm with a cover charge is $10 or $5 with a Club Serrano card. Dining guests can save the cost of the cover charge if they are still dining at 10 pm. Dinner reservations are recommended and can be made by phoning (909) 425-4889. DEVORE, CA - Glen Helen Pavilion in Devore is now known as San Manuel Amphitheater after the signing of a long-term agreement between San Manuel Indian Bingo and Casino and Live Nation for exclusive naming rights. The amphitheater is the largest in North America with 65,000 fans attending its concerts each year. "We are very glad to have San Manuel as a partner and look forward to working with them," said Nick Masters, president of Live Nation/So-Cal. "Given their strong live entertainment roots and close ties to the community, we think this is a great fit for the amphitheater." 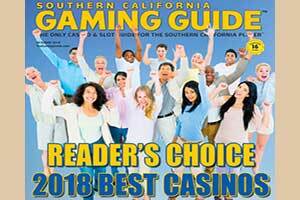 Steve Lengel, executive director of operations for San Manuel Indian Bingo and Casino, said "We are thrilled about this new opportunity to be associated with one of the premier outdoor entertainment venues in Southern California. San Manuel has always been focused on providing an unforgettable entertainment experience, and this latest partnership continues in that tradition." Crue Fest, featuring Motley Crue, Buckcherry, Papa Roach, Sixx:A.M., and Trapt - Saturday, Aug. 2. Tickets are $95, $75, $55, $29.50. ZZ Top, Brooks and Dunn, Rodney Atkins - Sunday, Aug. 3. Tickets are $85, $65, $45, $29.50. Rock The Bells, featuring A Tribe Called Quest and Nas - Saturday, Aug. 9. Other acts include the Pharcyde, Mos Def, Q-Tip, Redman, and Method Man, Rakim, De La Soul. Tickets are $175, $78, $59.50, and $35.50. Judas Priest, Heaven and Hell, Motorhead, and Testament - Saturday, Aug. 30. Tickets are $125, $75, $50, $35, and $20. SAN BERNARDINO - The federal government has given finalapproval to add 5,500 more slot machines to the San Manual Indian Casino, whichcurrently has 2,000 slots. The decision by the U.S. Department of the Interiorwas published in the Federal Register last Friday. The San Manuel will not face a voter referendum in the February 5th election forapproval. The tribe is not included in the propositions facing four other SouthernCalifornia tribes. Each tribes received state and federal approval to expandtheir number of slot machines, but the special-interest opposition filed referendums againstthe other four tribes and did not file one against the San Manuel Band. 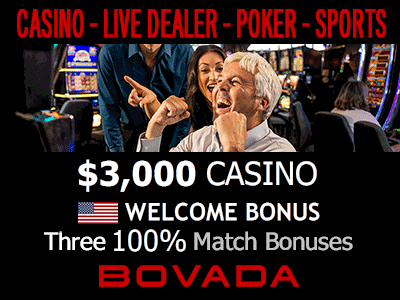 The organizers of the signature drives that brought Propositions 94, 95, 96, and 97 include UNITE, alabor union that would like to organize employees in all Indian casinos, andowners of horse tracks in Los Angeles and the San Francisco Bay areas. Unlikethe four tribes in the propositions, San Manuel already has a labor union, theCommunication Workers of America, and it does joint promotions with horseracetracks. If San Manual installs all 5,500 slot machines, they will pay the state ofCalifornia an estimated $7.2 billion over the term of the agreement which runsthrough 2030.